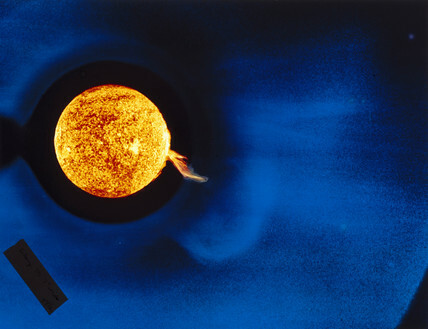 Solar coronal transient, photographed in ultraviolet light from Skylab, 1973. The corona is the very hot outer part of the solar atmosphere which consists of highly ionised gas superheated to temperatures in exces of 1 million degrees Celsius. Solar coronal transients are phenomena which occur in the corona and include events such as solar flares or coronal mas ejections (CME). Solar flares are sudden outbursts of energy originating on the Sun's surface and projecting far into its atmosphere. They occur near sunspots on boundaries dividing areas with opposite magnetic fields. CMEs are large bubbles of gas which are ejected from the Sun over several hours. Like solar flares they emit masive amounts of radiation which can cause radio blackouts on Earth and is potentially dangerous to astronauts. Solar prominences, Plate 10, 1872. Early photograph of William Herschel's telescope at Slough, 1839. Newton's first reflecting telescope, 1668. Eclipse of the Sun', LNER poster, 1927. Refracting telescope on observatory mounting, 1829.